Before earth and sea and heaven were created, all things wore one aspect, to which we give the name of Chaos - a confused and shapeless mass, nothing but dead weight, in which, however, slumbered the seeds of things. Earth, sea, and air were all mixed up together; so the earth was not solid, the sea was not fluid, and the air was not transparent. God and Nature at last interposed, and put an end to this discord, separating earth from sea, and heaven from both. The fiery part, being the lightest, sprang up, and formed the skies; the air was next in weight and place. The earth, being heavier, sank below; and the water took the lowest place, and buoyed up the earth. Here some god - it is not known which - gave his good offices in arranging and disposing the earth. He appointed rivers and bays their places, raised mountains, scooped out valleys, distributed woods, fountains, fertile fields. and stony plains. The air being cleared, the stars began to appear, fishes took possession of the sea, birds of the air, and four-footed beasts of the land. 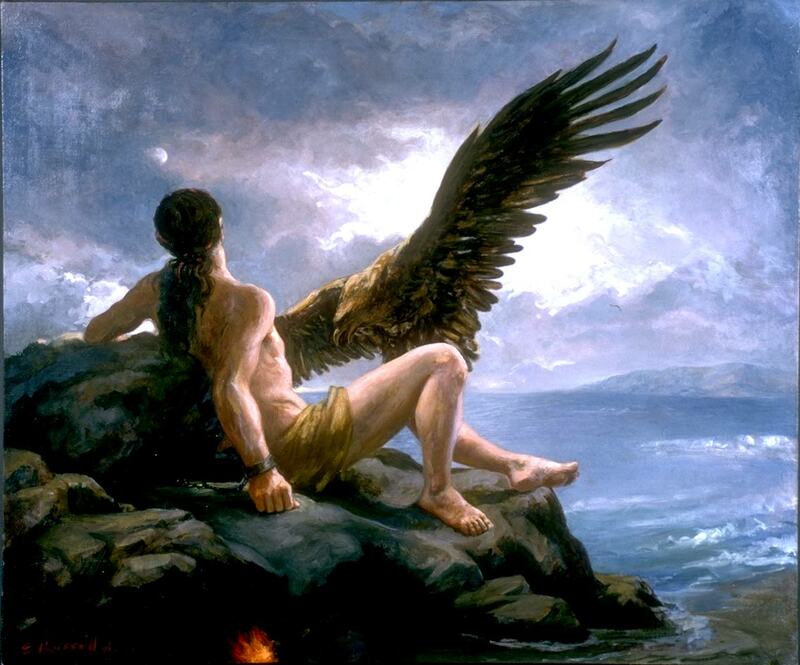 Prometheus was one of the Titans, a gigantic race, who inhabited the earth before the creation of man. To him and his brother Epimetheus was committed the office of making man, and providing him and all other animals with the faculties necessary for their preservation. Epimetheus undertook to do this, and Prometheus was to overlook his work, when it was done. Epimetheus accordingly proceeded to bestow upon the different animals the various gifts of courage, strength, swiftness, sagacity; wings to one, claws to another, a shelly covering to a third, etc. But when man came to be provided for, who was to be superior to all other animals, Epimetheus had been so prodigal of his resources that he had nothing left to bestow upon him. In his perplexity he resorted to his brother Prometheus, who, with the aid of Minerva (Athena), went up to heaven, and lighted his torch at the chariot of the sun. and brought down fire to man. With this gift man was more than a match for all other animals. It enabled him to make weapons wherewith to subdue them; tools with which to cultivate the earth; to warm his dwelling, so as to be comparatively independent of climate; and finally to introduce the arts and to coin money, the means of trade and commerce. Woman was not yet made. The story (absurd enough!) is that Jupiter (Zeus) made her, and sent her to Prometheus and his brother, to punish them for their presumption in stealing fire from heaven; and man, for accepting the gift. The first woman was named Pandora. She was made in heaven, every god contributing something to perfect her. Venus gave her beauty, Mercury persuasion, Apollo music, etc. Thus equipped, she was conveyed to earth, and presented to Epimetheus, who gladly accepted her, though cautioned by his brother to beware of Jupiter and his gifts. Epimetheus had in his house a jar, in which were kept certain noxious articles for which, in fitting man for his new abode, he had had no occasion. Pandora was seized with an eager curiosity to know what this jar contained; and one day she slipped off the cover and looked in. [image:28K (J.W. Waterhouse)] Forthwith there escaped a multitude of plagues for hapless man,- such as gout, rheumatism, and colic for his body, and envy, spite, and revenge for his mind,- and scattered themselves far and wide. Pandora hastened to replace the lid! but, alas! the whole contents of the jar had escaped, one thing only excepted, which lay at the bottom, and that was hope. So we see at this day, whatever evils are abroad, hope never entirely leaves us; and while we have that, no amount of other ills can make us completely wretched. * The goddess of innocence and purity. After leaving earth, she was placed among the stars, where she became the constellation Virgo - the Virgin. Themis (Justice) was the mother of Astraea. She is represented as holding aloft a pair of scales, in which she weighs the claims of opposing parties. Prometheus has been a favourite subject with the poets. He is represented as the friend of mankind, who interposed in their behalf when Jove was incensed against them, and who taught them civilization and the arts. But as, in so doing, he transgressed the will of Jupiter, he drew down on himself the anger of the ruler of gods and men. Jupiter had him chained to a rock on Mount Caucasus, where a vulture preyed on his liver, which was renewed as fast as devoured. This state of torment might have been brought to an end at any time by Prometheus, if he had been willing, to submit to his oppressor; for he possessed a secret which involved the stability of Jove's throne, and if he would have revealed it, he might have been at once taken into favour. But that he disdained to do. He has therefore become the symbol of magnanimous endurance of unmerited suffering, and strength of will resisting oppression.